I’m getting more done in less time, but where are the rich relationships, the inner peace, the balance, the confidence that I’m doing what matters most and doing it well?” Does this nagging question haunt you, even when you feel you are being your most efficient? If so, First Things First can help you understand why so often our first things aren’t first. Rather than offering you another clock, Stephen R. Covey provides you with a compass, because where you’re headed is more important than how fast you’re going. First Things First is a revolutionary guide to managing your time by learning how to balance your life. Traditional time management suggests that working harder, smarter, and faster will help you gain control over your life and that increased control will bring peace and fulfillment. But in the first real breakthrough in time management in years, the authors of First Things First apply the insights of The 7 Habits of Highly Effective People to our daily problems of struggling with the ever-increasing demands of work and home life. How to lead your life, not just manage your time. 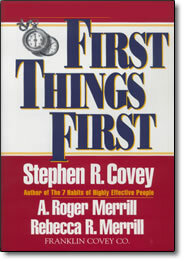 Offering a principle-centered approach and the wisdom and insight that made The 7 Habits of Highly Effective People a #1 bestseller, First Things First empowers listeners to define what is truly important: to accomplish worthwhile goals; and to lead rich, rewarding, and balanced lives.